3Way International Logistics Inc. is much more than freight forwarding and customs brokerage service provider. We handle partial or complete projects. 3Way Internatioanl logistics Inc. has since its inception in 2001 has successfully deployed major international logistics projects of all size and scale. Given below is a randomly selected list of some projects. Hazardous materials, oversized cargo, medical equipments, tempreture sensitive items or anything else or everything else. 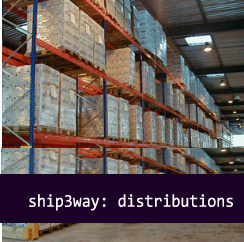 3Way distribution and warehousing solution. We handle all merchandise with care and diligence; as if it were our own.